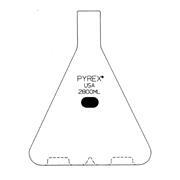 Manufactured from type 1 class A borosilicate glass and designed for culturing organisms requiring a large surface area-to-volume ratio. Class A Borosilicate Glass, 3 side baffles positioned at 120 degree and 3 bottom baffles offset from side baffles, GL45 PP Membrane Cap has a sealed in 0.2µ PTFE membrane, cap can be tightened during autoclaving. 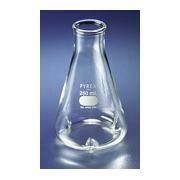 Triple baffled flask has a Delong style 38 mm neck for plastic or stainless steel closures. 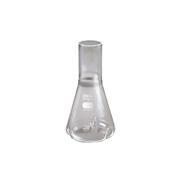 Triple baffles are located at the center of the flask bottom to achieve maximal oxygen transfer to culture medium. Closures are sold separately. Manufactured from type 1 class A borosilicate glass and designed for culturing organisms requiring a large surface area-to-volume ratio. 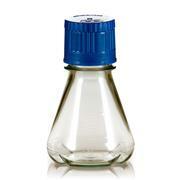 The flask is supplied with a GL45 blue polypropylene linerless screw cap and pouring ring. Dimensions: 200 x 157mm OD x OAH. 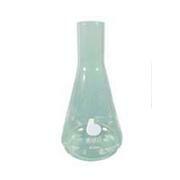 Fernbach style culture flask with mide-mouth neck and screw cap closure. Supplied with GL45 PP cap. Flask is triple baffled on outside edges for maximum oxygen transfer to the media. Caution! Do not place on direct heat source. Fernbach style culture flask with long style straight neck for either plastic or stainless steel closures, see Ace 3917 and 3918 product families. 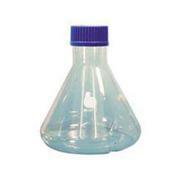 The bottom of the flask is triple baffled to achieve maximim oxygen transfer to the culture medium. Caution! Do not place on direct heat source. 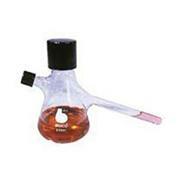 Trypsinizing flask with beaded neck and long side baffles. Ideal for converting homogenous tissue samples into cell suspensions by digestion of connective tissue. Heavy beaded neck accepts either cotton plugs or stoppers. The extra-deep baffles enhance vigorous agitation. …samples into cell suspensions by digestion of connective tissue. Side port has dam below the side arm to prevent undigested tissue from being poured out while decanting cells. Flask has GPI thread top and side arm cap. The three extra deep, extra long side baffles greatly enhance vigorous agitation. 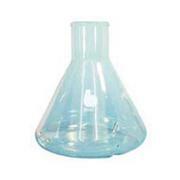 Flasks are ideal for preliminary fermentation and bacterial growth studies Delong style neck and three side baffles Borosilicate glass type 1, class A Closures sold separately* *125mL flask uses 25mm stainless steel closures only. 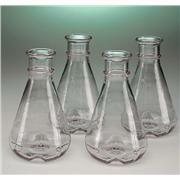 Manufactured from type 1 class A borosilicate glass with cleanout port and depressed sidearm. 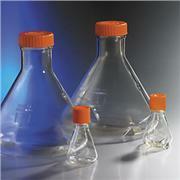 Flask is supplied with 38-415 black phenolic rubber lined cap and 18-415 sidearm cap. Baffles increase oxygenation of culture. Fernbach style culture flask with 38mm long style straight neck to accomodate plastic or stainless steel closures, see Ace 3917 & 3918 product families. Flat bottom, no baffles. Caution! Do not place on direct heat source. Nephelo style culture flask with 14mm od x 130mm side arm and long style, straight neck. Side arm designed to fit standard Nephelometers and spectrophotometers. 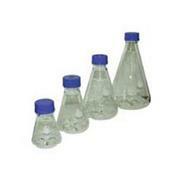 Cell culture shake flask with four bottom baffles to enhance mixing and gas transfer. 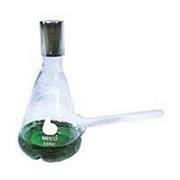 Flask has long style neck with constriction to reduce foaming and splashing of media. See Ace 3917 & 3918 product families for the appropriate plastic or stainless steel closure. Shake style culture flask with beaded neck and three bottom edge baffles to enhance mixing and oxygen transfer to media. 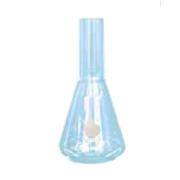 Nephelo culture flask with side port and angled side arm cuvette for standard Nephelometers and spectrophotometers. 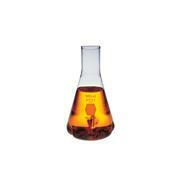 Supplied with 38-430 phenolic top cap and 18-415 clean-out port cap. Shake style culture flask with long style straight neck, accomodates either plastic or stainless steel closures. Without baffles. Manufactured from type 1 class A borosilicate glass with rigidly controlled baffle angles and depths to promote optimal oxygen transfer while reducing vortex formation. 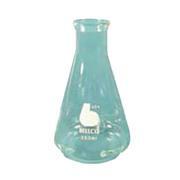 Flask has break resistant lip to resist chipping and is designed for use with Orbital Shakers. Shake Flasks are the basic tool for growth studies of aerobic microbial cultures and have rigidly controlled baffle angles and depths to promote optimal oxygen transfer while reducing vortex formation. Designed for use with Orbital Shakers. 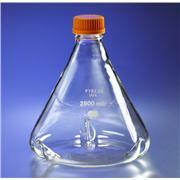 Shake style cell culture flask with beaded neck and three outside edge extra deep baffles. The extra deep baffles further enhance the mixing and oxygen transfer with the media. 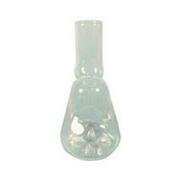 Manufactured from type 1 class A borosilicate glass with 3 bottom baffles and DeLong® neck. Flask includes a 25mm Bellco SST closure. Ideal for growing, storing and mixing of aerobic and anaerobic cultures.